Discussion in 'Console & PC Gaming' started by GTPNewsWire, Nov 13, 2018. This article was published by Michael Leary (@Terronium-12) on November 13th, 2018 in the Other category. It's going to be fun reading about people breaking them. rono_thomas, SiriusR, Victoria H and 2 others like this. It's bad enough shelling out $60-70 US for a DS4, I don't really look forward to $200+. Nexus, IngRobNy, MOPARbarrett5 and 7 others like this. Can't wait for the next Gran Turismo game's tagline: "The Real Text-While-Driving Simulator". alp, Simmpa, F2X M3CSL and 4 others like this. All i want is Backwards Compatibility with PS1/2 games. Manasseh257NSX, Outlaw2431, MOPARbarrett5 and 7 others like this. Considering the technology that goes into video game controllers like the DS4 with touch sensitivity, tilt axis gyros, good reliability (flaky rubber joysticks not withstanding) I don't think it's unreasonable at all. Especially since it will cost me 249.99 just to replace the glass not screen* on my cellphone lol. I think this is one of the hundreds of patents Sony makes but never uses,a screen on a controller would tank the battery life so much that you might as well use the cable all the time. acedition333, Nexus, SiriusR and 3 others like this. Your phone has plenty more uses than a controller that has to remain tethered to a system at all times, however. Nexus, FoRiZon and George Jakob like this. True, I was more comparing a simple repair, literally piece of glass. I still think it's amazing how much abuse controllers can take without breaking especially considering how accurate joysticks and pressure sensitive buttons are these days. I would ask for compat with ps4 games. alp, yas and klondike like this. Indeed they can but not for me , of course i would compatibility with al PS consoles if possible. Geez the blue bar thingy we have is pretty useless as it is, apart from draining the battery..
IngRobNy, MOPARbarrett5 and TheGeologist like this. Not true for those of us who use a Drive Hub. The DS4's Blue Bar Thingy turns into a RPM Indicator as the bar flashes green to yellow to red in various speeds of flashing, depending on where you are in the rev range. samdu, SiriusR, imported_rik19 and 1 other person like this. imported_rik19, danimac and potvinsuks like this. i loved my Dreamcast controller. Way ahead of its time. Novalee, lancia delta hf, Nexus and 7 others like this. Not the best pictures sorry, but you can see the different colors on the DS4 to the left and to the right you can see the RPM indicator on the Drive Hub itself. Way, way ahead of it's time for sure mate. I used to love being able to play couch - head to head playing Madden with these controllers because, you were able to select plays without your opponent (friend) being able to see what you were picking ,as the plays were on your controller rather then on the television for all to see.. Truly ahead of it's time. alp, Robin, Nexus and 4 others like this. They should just scrap the touch screen not add a display, remove the tilt functions as they are just an annoyance when required in some games and have analogue sticks that the rubber doesn't peel off from and have trigger buttons that don't break. Basically just an improved DS3, there was nothing wrong with them as far as controllers go. Sure gonna be interesting, but I really don’t wanna be looking at my touchscreen when I’m supposed to be looking at my tv. We’ll see how this one plays out. Me thinks Sony will announce PS5 in 2019 at E3 but release it either at the end of that year or sometime in 2020. Also wonder if PD will have two games on PS4? Or just start the next one for PS5? Probably the latter. Hmmmm... as mentioned in the article, this sounds a lot like a Switch rival. I've always loved the Vita, but it was kinda touted as a handheld device with PS3 level graphics. While the graphics do, for sure, impress, and it has a huge library of great games, I always just wanted to play mainline console exclusive games on a portable console. The Switch is such an amazing device for that reason, I knew it'd be a hit as soon as they showed the first glimpses of it's functionality. However, if the PS5 has the same kinda 'play mainline titles anywhere' functionality it'd have the potential to be one of the greatest PS consoles ever. Could break alot of general console records too, just like Switch has, especially if they're able to continue offering the same level of third party support. Also, think about how long it took Sony to emulate the functionality of the wildly successful original Wii. From a business standpoint, it is a no brainer to try to match one of the fastest selling consoles (maybe the fastest selling?). As far as the screen functioning as a small 2-3 inch insert on a DS type controller, I don't see the usefulness for that considering the kinda tech that is required. I can't deny it sounds cool, but I don't really see the need or advantage of this. Been gaming for 30 years and never thought to myself a screen on my controller is all I'm missing. Then imagine the price... There is so much they can play with costs before it's too expensive, or too unrealiable. While I'm sure there'll be a price premium, there's no way an LCD screen (or even an OLED display) at that size should bump the price of the controller by that much. Going back to the size of the display, I can't help feeling that it wouldn't be that useful. 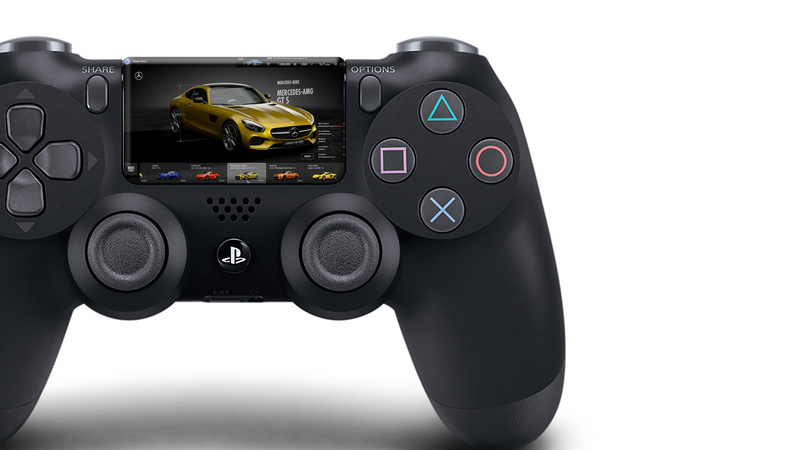 Looking at the size of the touchpad on my PS4 controllers I doubt there would be much in the way of meaningful additions that could be displayed in that space. My PC is not capable and it will cost me more to upgrade it. I hope PS5 to be backwards compatible with DS4 controllers. Clean PS2 Slims run something like $50 USD at most used game stores these days. I’d say that’s the best bet, unless you want to hunt down an original fat PS3. Fair point. I’ve found they’ve become less reliable over the generations, though. My PS2 is about to celebrate its 14th birthday and the controllers both still perform flawlessly. I’ve had to take apart my DS3s twice each so far to fix sticking analogs and buttons, and one of my DS4s already has some tiny piece of loose plastic rattling about inside. That paired with the sticker shock of a modern controller up here in Canuckland makes me anxious about the next-gen, especially as the existing touchpad/speaker/light combo is of dubious value. I’ve found they’ve become less reliable over the generations, though. My PS2 is about to celebrate its 14th birthday and the controllers both still perform flawlessly. I’ve had to take apart my DS3s twice each so far to fix sticking analogs and buttons, and one of my DS4s already has some tiny piece of loose plastic rattling about inside. I've noticed the same, prior to this generation I think the only controllers I've had go bad were 3rd party ones. I've had my XB1 for 3 years and I'm currently on my 3rd controller. The first was convinced I had my analog sticks fully right and the second would randomly disconnect until it just wouldn't connect at all even when wired. Hopefully the third time is the charm because if it's not I'll probably just be done with my XB1 and become all PC. Can't they just make an ordinary controller for ordinary people like myself? They added a touchpad, a speaker, a light bar and a share button to the DS4, but the only actually useful feature in my opinion is the share button. The only game I played that used all of these features to it's full potential was Infamous Second Son. Not all first-party games make use of these features, and even less with third-party titles, because they have to adapt the controls for both consoles, and the Xbox controller doesn't have any of these things. I think they should improove the touchpad but i don't believe the screen will happen it's just a dumb patent. And VR. Dual Shocks wouldn't be usable in VR without the LED.